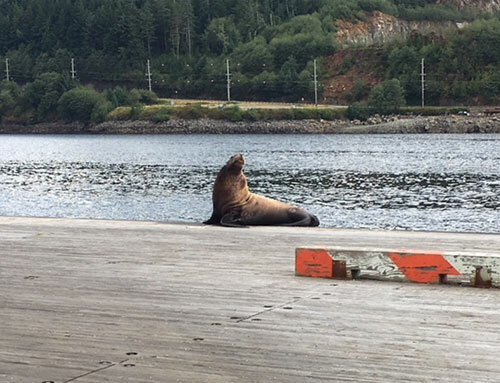 The photographer guessed the weight of this Steller Sea Lion at 2,000 pounds. Photographed at Ketchikan Airport's seaplane dock @ 10:30 Thursday morning. Steller sea lions can travel vast distances – one was once tracked from Kodiak Island all the way to Ketchikan, a journey of more than 900 miles. The Steller Sea Lion is named for early explorer George Steller. Southeast Alaska: Father Duncan died 100 years ago; 'Apostle of Alaska' was 86 By DAVE KIFFER - A century ago, an 86-year-old man passed away in Metlakatla. He had been in ill health for some time, after falling several months previously. The official cause was "apoplexy" which was then what strokes and heart attacks were thought to cause. William Duncan's death, on August 30, 1918, was noted in newspapers throughout the world. He was known far and wide as the "Apostle of Alaska." His role in founding two different Christian "utopias" in British Columbia and Alaska had made him famous - and somewhat infamous. Duncan's role is founding the Alaskan community of Metlakatla has been well documented ( See The Founding of Metlakatla, SITNEWS, August 7, 2006). Prior to coming to Alaska in 1886, Duncan had founded a similar community in Metlakatla, British Columbia, a village not far from the present site of Prince Rupert. After a childhood in Yorkshire, England, Duncan joined the Church Missionary Society (CMS) and in 1856, at the age of 24, Duncan was sent to Port Simpson (now Lax Kw'alaams) in north western British Columbia, not far from the then Russian America border. Port Simpson was the primary Hudsons Bay Company trading post in the region and Duncan soon became concerned that life at the Fort was negatively affecting the Tshimshian Natives. Duncan had decided that the best path forward for the Natives was to assimilate into Anglo culture, but at a location that was remote from contact with the Anglo culture and its many negative tempations. Shortly after, more than 200 other Natives joined Duncan at the new site. In setting up his "model" community, Duncan stressed industry and the renunciation of traditional Native ways in order to more easily assimilate into the Anglo culture. Among the new rules for the community were giving up alcohol and gambling as well as face painting and traditional Native healing practices. The potlatch ceremony was specifically banned. Residents were also required to send their children to school and to attend church. They were required to live in Anglo style homes and wear Anglo clothing. Duncan's hold over the new community was almost immediately strengthened when a small pox epidemic swept communities along the North Coast and more than 500 people died at Port Simpson. Only five died in Metlakatla and Duncan told the villagers that it was God's favoring that had generally spared the community. Unfortunately, Duncan's methods and his general ignoring of broader church rules were rankling his Anglican superiors. At least one attempt was made to recall him to England, which he just patiently ignored. Duncan was also beginning to deviate from church teachings in a variety of areas. Reportedly, Duncan ignored the sacrament of communion in Metlakatla because he was concerned that the Natives would misunderstand it, especially in relation to the cannibalism of some of the North Coast tribes that Duncan and other missionaries were working to eradicate. Most notably, Duncan was trying to erase much of the Tshimshian culture because he wanted to assimilate them into western culture as completely as possible. A seemingly minor thing that rankled the Canadian Anglican authorities was the fact that Metlakatla residents referred to Duncan as "Father Duncan" even though he was a lay leader, not a minister. Fish Factor: Bounty Hunters; Fish Money; Hatchery Facts & More... By LAINE WELCH - Cell phones are being used by fishermen to bounty hunt for lost fishing gear for pay. Southeast Alaska: SHI acquires last Chilkat robe made by master weaver Jennie Thlunaut - The Sealaska Heritage Institute (SHI) has acquired the last Chilkat robe ever made by the famed Tlingit weaver Jennie Thlunaut, one of the most celebrated Northwest Coast master weavers of the twentieth century who is credited with single-handedly keeping the tradition alive. SHI was able to purchase the robe because the sellers, former Juneau residents Dr. Robert and Winni Page, agreed to slash the price to approximately one fourth of what the piece is thought to be worth, said SHI President Rosita Worl. "Sealaska Heritage is a nonprofit with limited resources, and we couldn't pay full price. The uncommon generosity of these donors means that our artists will be able to study Chilkat weaving from the master herself, who made the robe at the end of her life and was considered to be a national living treasure," said Worl, who is Jennie's granddaughter and co-author of the biography Jennie Thlunaut, Master Chilkat Blanket Artist featured in the book The Artists Behind the Work. SHI Director of Culture and History Dr. Chuck Smythe also co-wrote the piece. Dr. 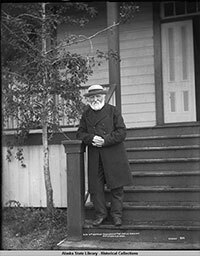 Page for years served as the only ophthalmologist in Juneau and the surrounding villages. Every year, he spent eight weeks traveling by boat to Southeast Alaska communities to treat patients with eye conditions. That was how he met Jennie. He was so highly regarded that Wóochx Kaduhaa (Jimmie George, Sr.) of Angoon adopted him into the Dakl'aweidí (Killer Whale) clan. Shortly after the adoption, Jennie went to Dr. Page to offer the robe for sale. Dr. Page believes she wanted him to have it because he was adopted into a Tlingit clan. Dr. Page, now 86, recently began to ponder what to do with it, and their former Juneau neighbor, Rose Risley, recommended that he contact SHI. "I was worried about what to do with it because it is such an outstanding icon of Native art and history in Southeast Alaska," said Dr. Page. "It is very pleasing to me and my wife, Winni, that the blanket is now at Sealaska Heritage Institute. That is where it should be." Southeast Alaska: $20,000 Donation Creates More Opportunities For Hands-On Undergraduate Work - University of Alaska SE senior Mollie Dwyer spent her summer hiking up mountains with a backpack of test tubes to collect water samples from different stream sources. Last year she had her hands full of kelp assisting with research on their reproductive process. 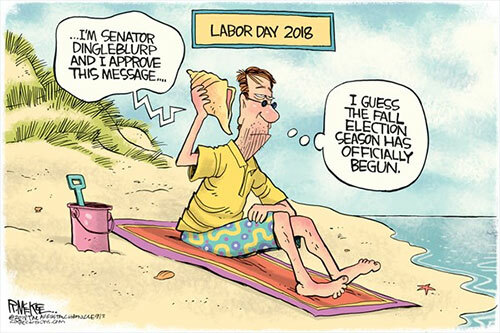 WILL DURST: Labor Day Gets No Respect - Let us take a few minutes to talk about the most underrated holiday of them all: Labor Day. Poor baby. It gets less respect than a MAGA hat at a Bernie Sanders rally. Like a half-eaten chocolate chip cookie in the Great British Bake Off. Or a Super Soaker at a Northern Idaho gun show. The trailer for a Pauly Shore movie at the Tribeca Film Festival. We treat it as the runt of the holiday litter without any proscribed traditions. Every year we wing it. No fireworks or clock-watching countdowns. No designated animal to eat or steal chocolate eggs from. No piece of vegetation to kill and either trim or gut. Maybe a couple parades so that politicians can get some waving-from-a-convertible exposure two months before the election. But that's about it. TOM PURCELL: The Higher Tech Gets, the Ruder We Get - Our rapidly growing incivility started with the invention of the telephone-answering machine. Before the answering machine's widespread adoption, people answered their landline phones with a pleasant "hello," eager to learn who was calling. To be sure, says social scientist James Katz, answering machines were considered rude in the '70s. By the '90s, however, most homes had them and lots of people were using them, quite rudely, to screen calls - people like my pal, Griffy. "Hello, this is Griffy, leave a message at the beep." "Pick up the phone, Griffy, I know you're there!" Griffy demanded his friends leave messages on his machine, but always hung up on mine - until the invention of the "star 69" feature. When you punched "star 69" into your phone keypad, you'd get the number of the jerk who had last hung up on your machine. Establishing Basic Protections for Salmon By Joe Mehrkens - Wild salmon stocks are under attack from all sides: ocean warming, habitat loss, over exploitation and pollution. While Alaska has enjoyed the benefit of good fisheries management, the cumulative impacts are taking its toll. Both professionals and non-professionals can see it in the watersheds around Southeast and in the salmon returns and harvests. One gillnetter moored across from me said he had only netted 7 Taku sockeyes this season. Simply stated, the risks of kicking the salmon can down the road makes a Yes on Ballot Measure 1 both critical and timely. I’m a retired hydrologist and forest economist. At one time I worked with a fisheries economist and a fisheries biologist to illustrate the relative economic values of timber versus salmon along fish streams. Our findings helped support the 100’ minimum no-harvest forest buffers on salmon streams in the Tongass Timber Reform Act of 1990. The Crisis at Waterfall By Austin Otos - The two waterfall bridges located on North Tongass Highway are a prime example of neglected local infrastructure that needs to be completely rebuilt in order to allow for basic access to the property owners that live beyond them. The Alaska Department of Transportation has allocated $10 million to upgrade the bridges and has slated the project to begin spring of 2019. The replacement of these bridges is of less concern than the much larger underlying issue, building a water tank for fire emergencies. Statement of Withdrawal By Ghert Abbott - I decided to run on March 25th as a result of Representative Ortiz’s then failure to put forth a clear, comprehensive plan for both the protection and increase of the permanent fund dividend. On August 23rd, Representative Ortiz published a plan calling for a lower draw on the Earnings Reserve, a lower state share of said draw, a greater system of non-regressive revenue in order to support essential pubic services and a larger PFD, and a commitment to make increasing the PFD a top priority as the state’s fiscal situation improves. These proposals, if fully enacted, would mean a moving away from the horrifically unfair PFD tax imposed on us by Senate Bill 26. In light of Dan Ortiz’s much stronger position in favor of the Permanent Fund Dividend, I felt it necessary to reevaluate my candidacy. Representative Ortiz supports fully funding our Medicaid Expansion, he has worked to protect our Pioneer Home, he has fought to reverse harmful cuts to our public schools, and he has defended our Marine Highway System. Tribute To CAPT John McCain, USN By Donald Moskowitz - John McCain was shot down over Vietnam in October 1967 after completing over 20 missions. He was a prisoner of war until 1973. While McCain fought in Vietnam our fearless President got four college draft deferments. After graduating in 1968 Trump visited a doctor who provided him with a letter stating he had bone spurs in a heel and this enabled him to get a medical deferment from the draft. He later said the bone spurs were "minor". Some things to think about By A. M. Johnson - Political activity of recent months surely has raised questions, caused consternations, given rise to conspiracy theory among other categories of politics mechanics.